What do you get in the Essentials Microblading Training Course? Blade theory - what to use in different scenarios and why. Nanoblade and Microblade. All for just £1999 - Contact Us today to book your course in West Yorkshire or Essex. Microblading is a treatment for implanting pigment into the skin to create a realistic hairstroke, or artistic eyebrow designs. It's very similar in principal to Semi Permanent makeup with a Machine - but the "Microblade" itself is a Hand-Tool (see image above, right). This method was popular 20-30 years ago, but is enjoying something of a resurgence at the moment. What's the Difference between Microblading and Machine SPMU? Microblading is a more cost-effective way of producing Semi Permanent Eyebrows. There's no machine involved, so costs are comparatively low. It's worth noting that, in general, Brows tattooed using a machine will last longer. In terms of design, or "look", the Machine does most of the work for you, while the Microblade requires a 'feel' that will develop as you train. You can create a finer hairstroke with a Microblade, but you are limited to Brows. The machine allows you to branch into Eyeliner, Lips, Meso, and Medical tattooing. The Machine is an evolution, or development, of the Microblade. Some people think "Microblading" refers to the style of brow, but Hairstroke is also taught with the machine. The Microblade itself is literally the Hand Tool you see in the picture above. Why is the Dermace Microblading Course the Best Training I can get? We've developed this course using contemporary techniques as well as Teresa's 25 years experience in Microblading and Advanced Permanent Makeup. We think we have a great blend of modern and classic microblading styles on our course, and we offer a fantastic range of supplies to back you up. We ensure you get a perfect balance of practical and classroom-based tuition, and classes never contain more than 2 students per trainer to ensure maximum attention to you. This training cannot be rushed or condensed, and our tuition and guidance carries on way after you leave the academy. As with all courses we offer, you get your unlimited support and mentoring built-in. We can add you into our Facebook Support Group where you'll mix with other Dermace techs and get the benefit and positive encouragement from techs of all skill levels. The price for the Dermace Microblade course is just £1999 for a Dermace Diploma Certificate. If you're a Machine-trained technician, then please head over to our Fast-Track section to your prices for Microblading. 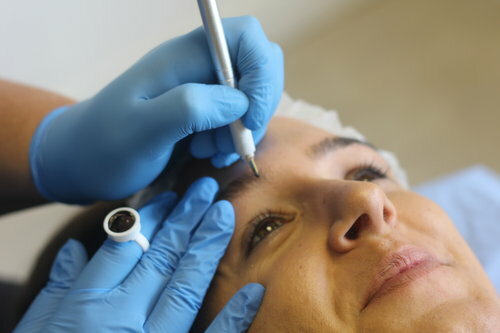 The Dermace Microblade Training offers the best gateway to Semi Permanent Makeup - and you can add in the VTCT Level 4 as an option if you wish! Message or call 07447777107 for more details.